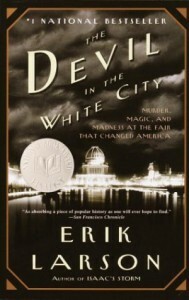 Summary: Bringing Chicago circa 1893 to vivid life, Erik Larson's spellbinding bestseller intertwines the true tale of two men - the brilliant architect behind the legendary 1893 World's Fair, striving to secure America's place in the world; and the cunning serial killer who used the fair to lure his victims to their death. Combining meticulous research with nail-biting storytelling, Erik Larson has crafted a narrative with all the wonder of newly discovered history and the thrills of the best fiction. - Vintage Books, 2003. I previously had listened to the book on the Lusitania sinking that Larson had written after this book so I was familiar with Larson's writing before reading this. I also am fascinated by older true crime so I was eager to dive into this book on H.H. Holmes. I'm already familiar to a certain extent with H.H. Holmes and what he did so I was curious to see how Larson would approach the subject. After reading it, I think Larson did a good job writing about Holmes, particularly if the reader is not familiar with Holmes at all. He writes about Holmes in a particularly suspenseful way while remaining true to writing the series of historical events. People who aren't major history buffs are likely to enjoy it because it's not thesis writing - it's everyday person writing. Larson divides the book into chapters about the World's Fair and chapters about Holmes. The chapters about the World's Fair are fine - they weren't as interesting as the Holmes chapters to me, but it was still great to get the background and circumstances that created the environment which allowed Holmes to do what he did. I felt much more informed than before after finishing the book. Some readers might not like Larson's writing style, but I think that comes down more to personal choice. I give The Devil in the White City an A.